Social media never fails to create drama. Indeed, the shortage of transplantable organs is a very real one. According to Donate Life America, an organization that encourages people to register to become organ donors, some 120,000 in the United States are waiting for an organ. Another person is added to the waiting list every 10 minutes and 22 people die each day waiting for a transplant that will never come. The organization says that while 95 percent of Americans are in favor of organ donation, only 52 percent are registered donors. Since I’m often incapable of making good choices regarding sharing controversial material on social media, I shared the video. The reaction was about what you’d expect. Some of my friends were horrified at the idea of not having control over what happens to their remains. Others stated that such laws were only forcing people to make good decisions and that such mandates were positive in that people “too lazy” to check a box would be automatic donors. 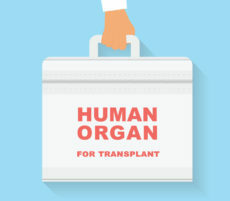 Others and myself have explained how a market for organs, one that allows for donor compensation, would work to alleviate the shortages caused by current policies, an increase in diseases like diabetes, and advances in healthcare. But I’d like to address the policy of an “opt-out” organ registry and the idea of compelling more people to donate their organs. First and foremost, an “opt-out” registry will not solve the organ shortage problem. The reality is that very few people can actually donate their organs upon their death. According to the Center for Organ Recovery and Education, only 2 percent of the 2.2 million people who die every year can feasibly donate their organs—about 44,000 people. (In order for organs to be viable a person has to die in a very particular way and few people fit the criteria.) If every single one of them donated, you still wouldn’t have enough organs to mitigate the shortage. Some will look at that number and argue that, while it may not fix the problem, it could help. So they argue for an opt-out registry or even for compulsory donation. The new French policy is an example of “opt-out” registry. Individuals are presumed to be organ donors unless they explicitly state they want off the list. Contrast this to an “opt-in” registry, like the one in the United States. Every time you have your license renewed, you have the option of signing up to be an organ donor. Instead of being an assumed donor, you are only placed on the registry if you express your desire to donate. The difference seems subtle—but the implications are not. An opt-out system for organ donation is a prime example of what’s referred to as “soft paternalism” or “libertarian paternalism,”* giving government some power over individual decision-making in the name of the “greater good” and increasing “societal welfare.” In the case of organ donation (and other choices), it’s known that people will tend to choose the default option. If the default option is “organ donor,” for example, more people are likely to be donors and vice versa. Proponents of paternalist policies, like opt-out organ donation, look to exploit this potential bias in an effort to influence decisions. Call it what you want, it’s government interfering in personal decisions. It’s Mr. X saying he know’s better than Mrs. Y what to do with her body. My guess would be that if I asked most people commenting in favor of an opt-out system, or even compulsory organ donation, if they believed in private property rights, they’d say “yes.” If I asked them, “is it right to “nudge” or compel a living person to donate a kidney or piece of their liver they’d say “no.” It seems odd to me, then, that the same people are OK with pushing or compelling people to have pieces of their body taken without explicit consent. It doesn’t matter the reason an individual decides not to donate their organs upon their death. Perhaps a person is Jewish, Muslim, or a Jehovah’s Witness and his religion requires his body to be whole. Maybe someone has a fear of feeling pain if his or her organs were to be harvested. Maybe someone is just plain selfish. The topic of organ donation has life and death implications. As such, it’s easy for emotions to rule the day. With such staggering numbers of individuals on the transplant list, many people don’t have to look far to find someone who is directly affected. My family has experienced organ donation up close and personally from the donor side. It’s gut-wrenching for all involved. In any case, such high-stakes make it very easy to look at policy suggestions and immediately jump on board. This is all the more reason to very carefully discuss and articulate ideas and policies surrounding organ donation. When it comes to an opt-out system or compulsory donation, tread carefully. You may lose the right to your body as a result.